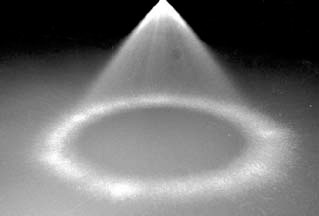 SPRAY CHARACTERISTICS: A hollow cone spray pattern, similar to the BEX H series, but with a wider spray angles. The included angle of the spray cone is 120° at 10 p.s.i. 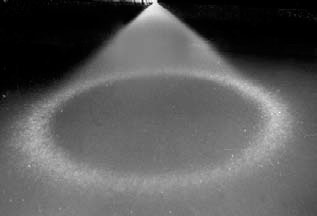 SPRAY CHARACTERISTICS: A hollow cone spray pattern for phosphating applications. This large droplet low impingement type of spray resultes in a tighter and more consistent phosphating crystalline structure. SPRAY CHARACTERISTICS: ILH series in-line hollow cone spray nozzles produce a very evenly distributed hollow cone spray which emerges through the center axis of the nozzle body. At lower pressures, they produce medium sized, uniform droplets. Finer droplets are produced at higher pressures. 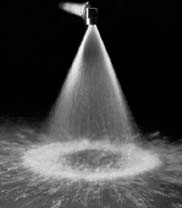 SPRAY CHARACTERISTICS: A hollow cone spray pattern with larger flow rates and smaller droplet sizes. Durable, one-piece, anti-clog design has no internal vane to clog or wear out. C series hydraulic atomizing nozzles are designed and precision machined to provide a very fine hollow-cone spray using only the liquid pressure for atomizing.